StemEnhance® Ultra is the result of 16 years of research and constitutes the most efficacious and scientifically proven stem cell support product in the market today. 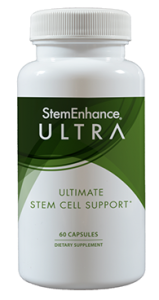 Through multiple clinical trials, StemEnhance® Ultra was documented to optimize stem cell function in the body by increasing the number of both stem cells and Endothelial Progenitor Cells (EPCs) in the blood circulation. The human ability to heal is remarkable and proper blood circulation at the capillary level is essential to ensure appropriate delivery of nutrients, oxygen, and cells for optimum health. Capillaries make up 95% of the total surface of all blood vessels extending into every region of the body where they serve as points of exchange between the blood and surrounding tissue. The body‘s natural ability to deliver stem cells is dependent on the health and integrity of capillary function and their ability to travel freely through unobstructed blood flow. The ingredients in PlasmaFlo™ were extensively researched and meticulously chosen from the industry‘s most reputable, GMP certified companies and are backed by science for their efficacy and safety. All ingredients, including Cerule‘s own, undergo rigorous quality testing in-house with 3rd party verification. The ingredients in all of our products are guaranteed for purity and safety. PlasmaFlo™ was formulated to perform unique functions that support healthy circulation. Inflammation is a double-edged sword. While short term inflammation is a necessary and healthy response to injury, inflammation caused by prolonged stressors can cause a healthy inflammation response to get stuck in an overactive cycle. 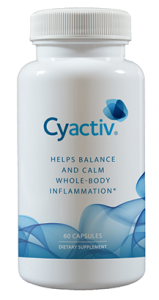 Cyactiv helps support a healthy inflammation response. Phycocyanin is well researched and is known as a selective inhibitor of COX-2, a key enzyme involved in inflammation. Cyactiv is the result of 7 years of research and development and includes 4 human clinical trials and numerous in-vitro studies. A recent dose study confirmed that consumption of Cyactiv was safe and not associated with any side-effects linked to stomach, heart, kidney or liver function.